Same as “Carmen” or “Nessun Dorma”, the Tchaikovsky’s famous ballet “Swan Lake” composition belongs to the list of the most overused music pieces in Figure Skating history. For many years the story about Black and White Swan has occupied the ice using countless variations and motives of the famous piece. Let’s have a look at the “Swan” performances that stood out of the crowd the most. American skater Rudy Galindo was the U.S. pair champion with Kristi Yamaguchi but he never made the podium at the Nationals in singles. That changed in 1996 when he broke the house down with his flawless “Swan Lake” free skate! This performance has definitely a place in the golden archive of U.S. Nationals. And Rudy’s reaction when he finds out that he just won the title is just priceless! U.S. National champion Ashley Wagner performed to “Black Swan” in 2011/2012 season. The great choreography was done by Phillip Millls and Ashley rocked it. Thanks to this performance she became the U.S National champion for the first time in her career. Russian ice dancers Elena Ilinykh and Nikita Katsapalov have stunned the crowds with their “Swan Lake” free dance during the whole 2013/2014 season. They shined also at the Olympics where they moved to the third place thanks to this performance. One of the most decorated Figure skaters from Japan, Mao Asada, skated to “Swan Lake” during the 2012/2013 season. This free skate was another perfect fit for her as she started her sport career as a ballet dancer at the age of three. Mao managed to win both Grand Prix events and also the Final with this program. The last sequence of this skate is truly to die for. Japanese star Daisuke Takahashi would probably get the crown for the most original take on the famous ballet piece. He took the traditional “Swan Lake” and turned it into the modern Hip Hop skate. Add perfect jumps and flawless step sequences and you are looking at one of the most exciting performances ever done by men in competitions. Hands down! American ice princess Sasha Cohen was many times called as “Ballerina on the ice”. It is no surprise that Tchaikovskij’s “Swan Lake” was the perfect music fit for the skater who was always known for her flexibility and gracious movements on the ice. She struggled with consistency during the years but this performance belongs to one of her best. Stunning! If we would need to select only one “Swan” of them all that was the most iconic one, it would need to be Oksana Baiul’s. She skated to “Black Swan” for her Olympic short program and then to after her marvelous victory. 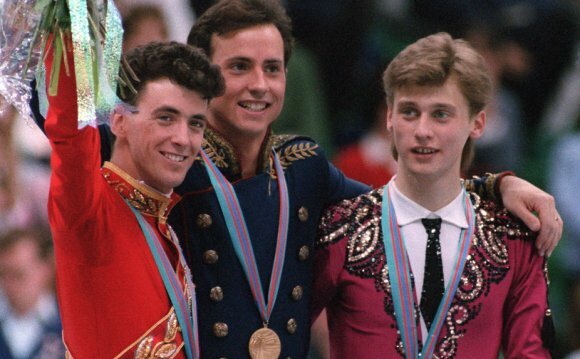 This piece belongs to one of the most memorable performances ever done on the Olympic ice. U.S. National champion Johnny Weir belonged to the top of the Figure skaters field for several years but he never managed to get on the podium at the big competitions. At the 2006 Olympics in Torino he performed short program “The Swan” by Camille Saint-Saëns inspired by the performance of his idol Oksana Baiul. This skate moved him to the second place and turned him to one of the favorites for the medal. He finished 5th after the free skates but “The Swan” will be remembered as one of the best performances of his career.